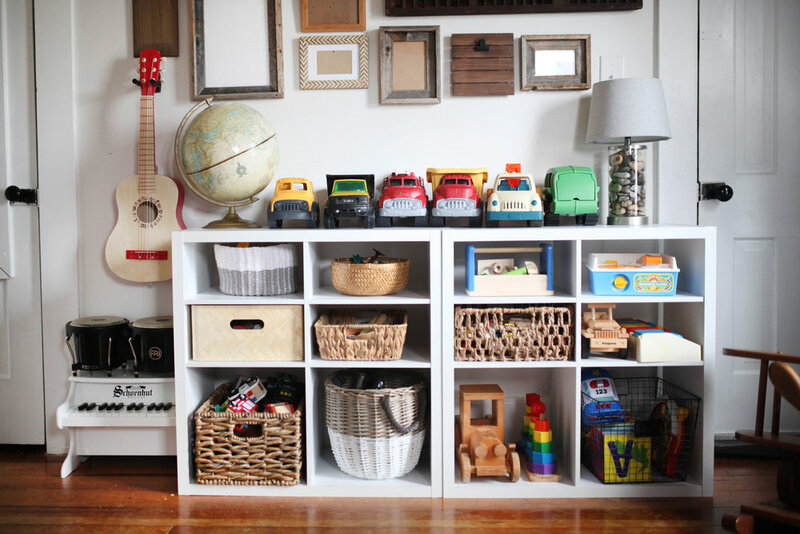 I shared a bunch of gift ideas for minimalists right here, but what about their kids? I just re-organized our toys recently and it has me thinking a lot about how much kids need, and how to handle the subject of gift-giving when it comes to kids. When birthdays or holidays roll around, this might be a helpful list to forward to your relatives and in-laws, or to bookmark if you have a minimalist in your life and you're stumped as to what to gift their children that they won't be annoyed by or end up donating! Of course, I firmly believe that you don't need to give gifts to celebrate people. However, I also recognize that giving gifts is how some people show love and they might need a help when it the kids in their life whose parents embrace a simpler lifestyle :) Here are my best options! Books. Always a good idea to double check with the parents, but most minimalist parents won't object to books as gifts. Bonus tip for you minimalist parents: make an Amazon wishlist of books you'd love your little one to receive! I made one before Xavier's birthday, and it was so handy to be able to send that to people who asked for specific gift ideas. This one and this one are on Xavier's wishlist! An experience or activity. An experience always trumps a THING, in my book. Gift a day pass or gift card to a museum or zoo (make sure they don't already have an annual membership, or plan a day to actually go with your friend and the littles! Ask the parents if there is a day camp or fun class they've been dying to take. A homemade voucher for an ice cream date, a date to paint pottery (or giftcard if you're far away) or tickets to a sporting event or show would also be so meaningful! Something they need. As a minimal-minded mama myself (say THAT ten times fast), I always love receiving something Xavier NEEDS as a gift. Ask mom or dad what their tot needs, and pick something to give them! I know it seems boring, but they'll think of you every time they put on those fire truck jammies you got, or each time they zip up your gift of a winter coat. Bonus tip for parents: keep an Amazon wishlist of things your babe needs or items you'd like. You can pass that along when relatives or friends ask! An outside toy. Personally speaking, I'm more laid back about the amount of outdoor toys vs. indoor toys, because I generally don't have to pick them up or maintain them as much. Check with the parents to see if there's something fun for outside you can give. Bubbles, a ball, a play tent, a kite, a hula hoop, a water table, a mini trampoline, a swing, etc. Craft supplies. Again, ask your friends (the parents), but I know many mamas would love a gift that re-stocks the craft closet. We are always going through crayons, paints, foam brushes and stickers (sooo many stickers.) Putting together a cute little gift bag of well-loved art supplies would be so thoughtful and useful! A fun subscription. There are so many cool subscription boxes nowadays, including some great options for kids! 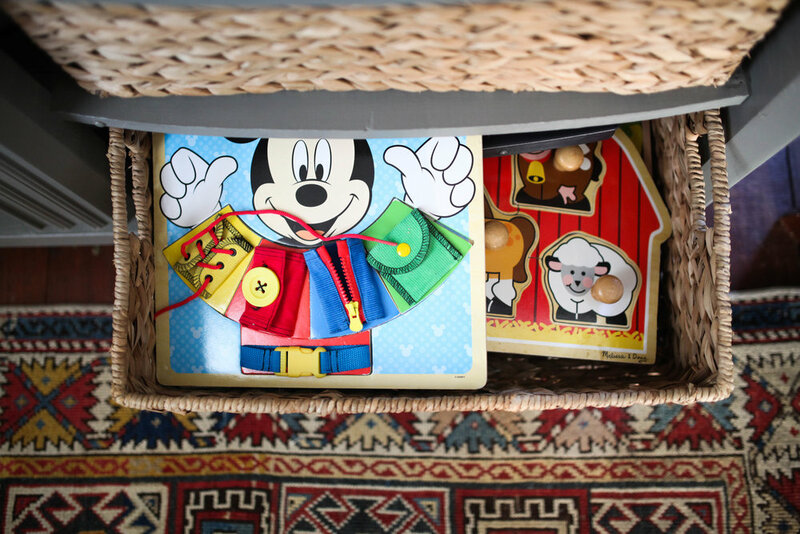 Gifting a subscription to KiwiCrate for the little scientist in your life, a Little Passports box for the future traveler or KidStir for the next master chef would be the gift that keeps on giving, literally! Tip: google "subscription boxes for kids" to get even more ideas! Minimal mamas - what did I miss? Anything else you'd add? I'm always on the hunt for more suggestions! I dreaded the toy situation before I ever became a mama. I knew from years of nannying that toys could easily (and often!) get out of control, taking up living rooms, playrooms, bedrooms and basements. We don't have a playroom, or a basement, and it's important to me to have a home that reflects my personal style and feels like mine, instead of a daycare center. How on earth was I going to achieve this?! I will say, it hasn't been easy. It takes near-constant and mindful editing of our toys, hard conversations with well-meaning friends and family members and being super intentional about the toys we add to our collection. But, it's totally worth it. Our toy situation is, in my eyes, pretty minimal. Xavier plays with ALL of his toys. They are toys that allow open-ended play, space for his imagination to run wild. Hardly any of them beep or flash or make incessant noise. Very few of them require batteries. Most of them are pretty to look at. I'm actually pretty proud of our toy situation, and wanted to share it with you since I know so many mamas are overwhelmed with toys! The storage units are from Target, super similar to the KALLAX unit from IKEA. I get asked all the time about the differently sized shelves - those are just shelf inserts that Target sells separately. I originally didn't get them, but quickly realized that it would make the unit way more functional to have a few smaller-sized shelves. All the baskets and bins are collected from various places...thrifted, IKEA, Target, At Home. I really love the eclectic look of mismatched but coordinating, but you could totally make it super uniform and get all matching bins/baskets, too! Also, is the fact that garbage truck is backwards bothering anyone else?! I obviously took these on the fly when everything was miraculously in its place without bothering to "style." Real life, folks. We also have a few toys in our living room, mostly bigger items that don't fit in the kids' room and also books. Our dresser/shelf unit holds a big basket of legos, a big basket of puzzles, and a few toys for Zelie. We have a big basket of board books, a basket for all our library books, and the bottom shelf of one of the cabinets holds all of our picture books. Xavier loves to "be cozy" on the couch to read, so having all the books easily accessible in the living room works great. Like I mentioned, I love open-ended toys that encourage imaginative play. We have a Montessori-esque approach to toys as far as that goes. Xavier has a LOT of trucks/cars/construction machines, because that's what he's into and he plays with them for hours (in 10-minute blocks of time, of course!) I love all the ones from Melissa + Doug, and the Green Toys brand have held up really well, too. We have a wooden train set. Lots of instruments - I am all for encouraging music and we have a dance party with instruments pretty much daily. Legos, wooden blocks, toy animals. We also have a few vintage items from Matt's childhood, like that Fisher Price record player and an original Disney Poppin Pals (which Zelie is OBSESSED with!) A wooden tool set, some cardboard stacking blocks. Of course, we have some things I wouldn't normally choose or keep, but that Xavier loves, like a police car that lights up and makes noise, a super annoying racecar my aunt got him, an electronic drill, and a few other random items. I'm learning that I don't need to control every last thing and that the season of loud + annoying toys is a short one, all things considered. We do have a few items that stay in the closet unless we're using them, like Xavier's balance bike, a walker wagon, and a cool ramp race that I found secondhand. I also have a couple sensory bins, and an "activity box" full of random things like solo cups (great for making "castles! ), pipe cleaners (for "fences" for his animals! ), paper towel tubes for rolling balls through, etc. And we have the usual art supplies, stickers, a bin of play-doh, yada yada. I'm committed to only keeping things that fit within my current system. If a basket is overflowing, we don't need to add anything else. Xavier needs no more trucks or cars or anything like that. We also don't buy toys on a whim. So far, the kids have gotten new toys for Christmas and their birthdays. Instead of Easter baskets, they're getting a beautiful wooden rainbow (so perfect for Easter, right?) and a gorgeous wooden barn (springtime and all that jazz). And then they won't get anything new until birthdays or Christmas. I will admit, sometimes I second guess my quest for minimalism, especially when it comes to my kids. Am I depriving them? Are they missing out? But when I really sit back and watch how Xavier's imagination runs wild, how he's able to turn anything into something for play, how long he will play independently, I know that it's totally worth it. 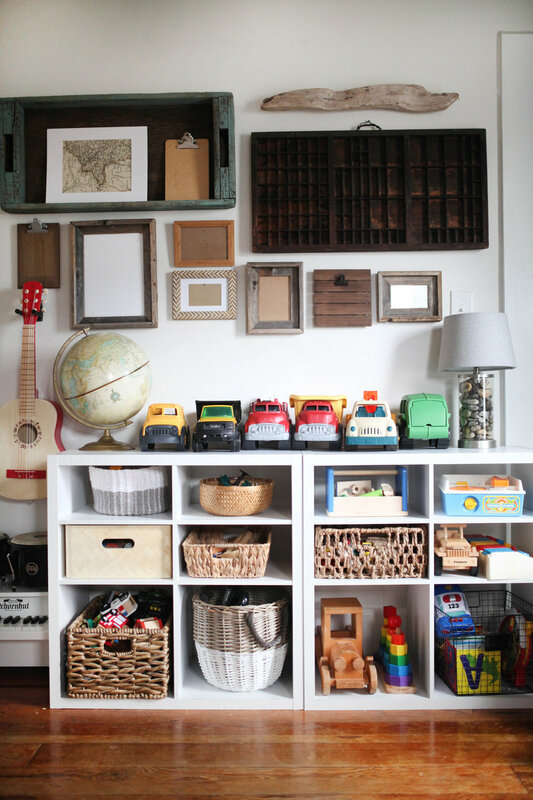 Kids are great at playing - so often we just need to get our ideas and our clutter out of their way! P.S. if you're curious about minimalism + kids, you might also like this post about keeping kids clothes minimal. MINIMIZING: WHAT ABOUT THE "MAYBES"? I got a question last week on Instagram that sparked the idea for this blog post. A sweet follower, Morgan, asked this, "I am fine purging stuff when its "keep" or "definitely not" but how do you work through the "maybe" pile that is the actual problem?" I think she brought up a really good point, and something that becomes a stumbling block for people who are trying to minimize. It's easy, like she said, to differentiate between the obvious "keeps" and the obvious "throw aways." Your favorite pair of jeans, keep. The broken toy with the missing wheel, toss. But what about those things that you just might use? That you don't have space to display currently but really really love? That you don't use regularly, but are nice to have around? I think a lot of people reach the point where they have a pile of "maybes", unsure whether to keep or toss them, so they quit. The decisions, one after another, are overwhelming, they aren't sure what's "right" and the minimizing train comes to a screeching halt. I certainly can't give a black-and-white, works-in-every-situation formula for this, because it's true: it is hard. That "maybe" pile takes a lot of decision making, and a lot of intentional thought. I think about the last time I used it. For instance, I had a garlic press in my utensil drawer. Any "kitchen necessities for the home cook" list will say that you absolutely need a garlic press. As I held my very lovely garlic press, I tried to remember the last time I used it, and drew a blank. Although I know fresh garlic is the best option in any recipe, I honestly always reach for the jar of refrigerated, pre-minced variety. It's easy, and quick. So although it's deemed a "necessity" for many, a garlic press is not, in reality, a necessity for me. I try to envision the next time I'll use it. On the flip side of the garlic press, there are things I haven't used in awhile (years, even), but that I realistically picture myself using again. A great example are the hiking backpacks that my husband and I each own. I bought mine for a backpacking trip in college, and used it for a few mission trips here and there. It's been hanging on a nail in our garage and hasn't been used since before we got married nearly four years ago. Some would say I should let it go. And honestly, by my own usual rules of "have I used this in the last year? ", it should go. But! Hiking and backpacking are still very much interests of mine, and I realistically envision using it again sometime in the future, even if that's 10 years from now. It was expensive, it's in good condition, it's easy to store, so I'm keeping it. Another (opposite) example: my snowboard. One year for Christmas, my brothers and I each got our own snowboard. I've used it a handful of times, and it's nice to own your own equipment and not have to rent, which can be expensive. But I haven't snowboarded in probably five years, and I don't think Matt knows how, and I can't imagine the next time I'll be hitting the slopes, especially now that we'll have two kids. There are so many other trips that are high on our priority list. So, I'm going to sell the snowboard and snowboard boots. It just isn't worth it to hold onto, for the "maybe someday when we take a ski trip" possibility, especially since I can just rent equipment if that trip ever comes. Temporarily remove the items, then re-evaluate. If I truly can't decide if an item should stay or go, I put it in a specially marked bin to be stored out of sight, and re-evaluate in three months. The trick is to not put all of your stuff in here, only things that are really tripping you up, so you can continue to make forward progress. If I think of something in the bin that I want or need, I go grab it, and I keep it. After three months, whatever is still in the bin gets tossed (donated, sold, whatever.) I used this approach to make the jump to a capsule wardrobe and it worked really well. Consider the cost of storing vs. replacing down the road. The biggest area that comes to mind for this particular strategy is with baby and kid stuff. We are in our "family building" years and, Lord willing, hope to have a few more babies before we're done. Even though we're due with a girl this June, I'm hanging onto all of Xavier's boy stuff, because we might someday have another boy. Sure, the boy stuff might not be the right size for the right season, but I just don't know yet. And since I have very little clothing saved (one tote bin for size newborn - 9 months and one tote bin for size 12 months - 3T, so far), I have space to store it for several more years and don't mind doing so. The same is true for all the baby gear. Even though this next baby might not like the MamaRoo or bouncer seat, another child down the road might love it. 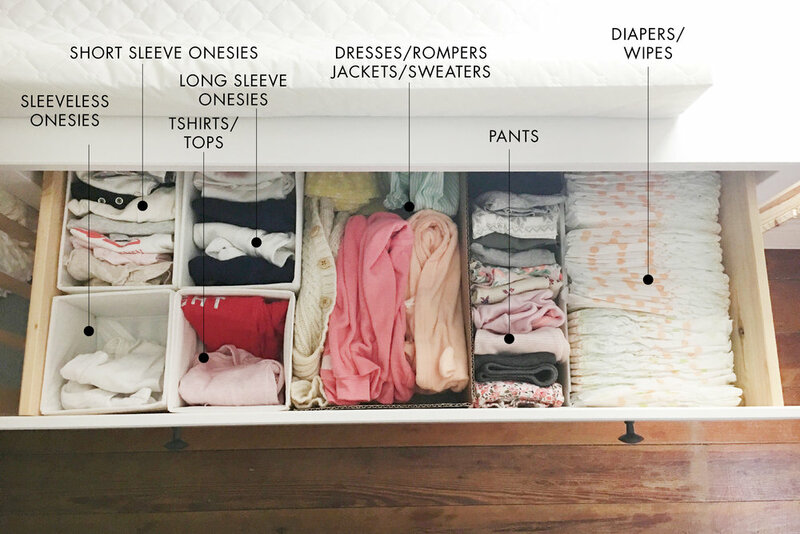 I tried to pare down to what we really used and really loved (i.e., I got rid of every single sleeper that had snaps, and only kept the ones with zippers, because snap sleepers were impossible for me!) and let friends borrow things like our MamaRoo while we aren't using them. Also, we aren't really buying more baby gear until we need it. Meaning, if this sweet girl hates the MamaRoo and the bouncer seat, we'll consider buying (or borrowing!) something different, like a traditional swing or a Rock-&-Play. It can definitely feel like we're hanging on to way too much stuff, but the reality is that every child is different and might prefer different things, and since we have room to store stuff, it makes more sense for us to just hold onto everything we have, rather than donate or gift it and have to replace it down the road. The most important thing, though, is to just be realistic. If that set of beat-up, Craigslisted dining room chairs have been sitting in the garage for three years, just waiting for you to get around to refinishing them, it might be time to let them go. That project obviously isn't a priority for you right now, and that's okay! I think about all the home decor I have stored in our attic. Our wall space and flat surfaces are pretty maxed out on decor right now, yet I have two bins' worth of stuff upstairs. Why? Well, this is not our forever home, and we plan to either renovate (adding 3+ rooms that will need to be furnished and decorated) or move within the next few years. So I feel okay holding onto those decor items, knowing they'll realistically get used in the foreseeable future. If we were in our forever home, or had no plans to move to a bigger space anytime soon, I might feel differently about keeping so much stuff that didn't fit the space we currently had. So, there are my very long-winded thoughts on how to handle those tricky "maybes" that will inevitably come up as you're trying to minimize. It will take time, and maybe a couple passes through the same room, to come to a decision, but just remember that rarely are your decisions completely permanent. If you decide to keep something you end up not needing, you can toss it! If you end up tossing something you want later, you can replace it! Except in the case of heirlooms (and I'm a sucker for heirlooms, so no judgment if you hold onto a lot of them!) everything is replaceable. Always happy to offer more insight, although I can't imagine there are any more questions after this 5,000 word post ;) XO! It seems a little silly to be writing a post about winter outerwear when it was 65 degrees and I wore leggings and a tank top to the park this weekend, but it is January after all, even if Indiana can be a little volatile when it comes to Mother Nature. You might have noticed, or maybe not at all, but I've started to veer away from the "traditional" 37-piece seasonal capsule wardrobe (can I say traditional when this capsule thing is only a couple years old?!) and am thinking about my clothes in terms of mini capsules instead. For instance, a workout capsule, a loungewear capsule, an outerwear capsule, etc. I still have a minimal wardrobe, but it's helpful to think of all those "extras" in capsule terms, too. Today, I'm sharing the outerwear CAPSULE with you! I live in Indiana, where we have four distinct seasons. In the fall, winter and spring, it can be wet, muddy, snowy, icy and cold. Good outerwear is a must. But, as with every area of your closet, it's possible to go overboard. Early this winter, I thinned out my outerwear items and pared down to just the things I love and used often. Here they are! That's it! I also have a denim jacket, a faux leather jacket, a green utility-type jacket and a puffy vest, but I don't consider those outerwear, since I wear them more as regular outfit clothes, versus a top layer over everything, if that makes sense. All our cold-weather accessories, including Matt and Xavier's, fit into a single drawer in our laundry room. In addition to his winter coat, Xavier has one pair of mittens and one hat. Matt has a rain/utility jacket, a heavy winter jacket, a dressy peacoat, two pair of gloves and one hat. 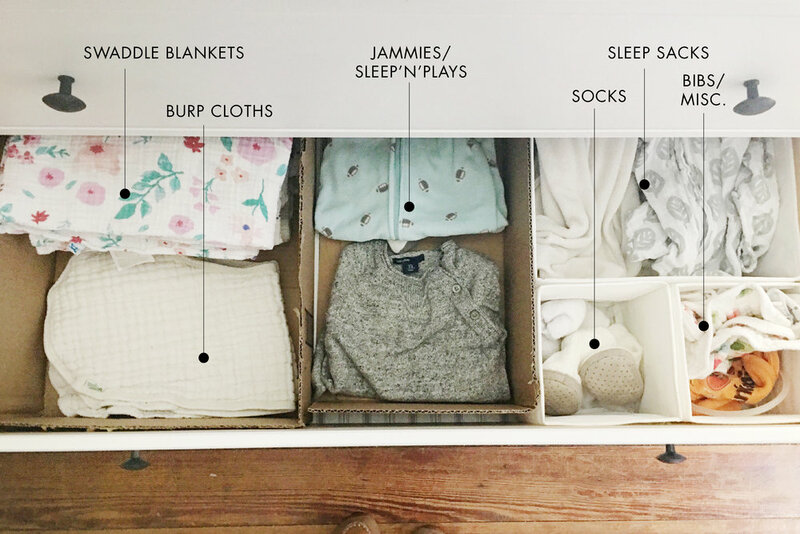 All of the hats, gloves and scarves tuck nicely into this drawer year-round, so no storing bins in the attic and pulling them back down in the fall. Xavier and I also each have a pair of waterproof snow pants. And that's it! I would like to swap out the black rain jacket for something a little more feminine, like this swing trench or this cute anorak. But, the rain jacket I currently own is nice for hiking or outdoorsy adventures since it's designed for that, so I'm torn. Additionally, I'd also like to trade my everyday winter coat for a longer, warmer puffer-type coat. I've been scouring secondhand sites, so we'll see when that happens. If you're looking for a puffer vest, this one or this one are both good options. Both companies (Patagonia and Marmot) have good social responsibility policies! Or there is this one, which comes in a few fun colors. This parka from Prana looks awesome, and I just noticed that it's half off! They have lots of other jackets and things in their outerwear section as well. If you're looking for a shorter length, this short puffer coat is a good option. A cheerful yellow raincoat, for a pop of color on dreary days. If you need some new accessories, good sources for hats, gloves and scarves are Krochet Kids and Everlane. And don't forget to check resale sites like ThredUp, Poshmark, Schoola or Swap.com for great deals on gently used coats and outwear! I've gotten Xavier a couple coats secondhand, and since kids grow so fast, they're practically new! Happy (cozy!) shopping!